Hendrix Motorsports contracted with John (Desert Toy) James to manufacture the "James Link" exclusively for the rear suspension of our X chassis. This is the ultimate in 4 link suspension. Designed for articulation the "James Link" is superior in performance to all other link type suspensions. 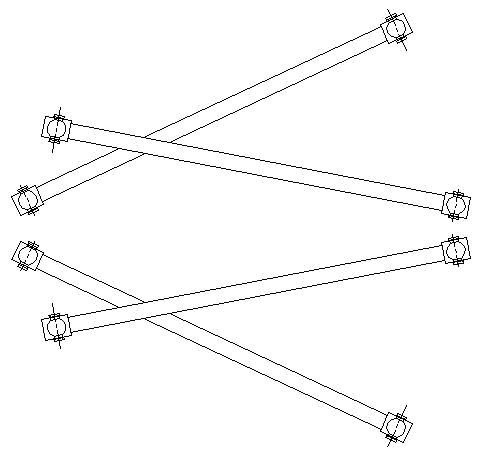 Sub-frame with front and rear link mounts $995.00. Upgrade to .188 wall 4130 tubing for $85.00 more. Hendrix Motorsports has come out with their own rod end called the the X-joint. $44.95 each. Included are: 9/16 grade 8 bolt and nut, stress proof ball, DOM shell with zerk hole, extra heavy washers, poly cups with integrated grease passage and zerk fitting.